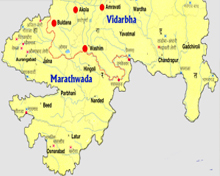 The region Vidharba and Marathwada which is now called as Maharashtra .DhandaKaranya is the epic name of Maharashtra. 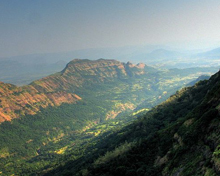 The name Maharashtra first appeared in a 7th century inscription and in a Chinese traveler's account. In 246 B.C.E Maharashtra is one of the places under Mauryan Empire mentioned in The Nasik Gazetteer.Then the eastern region of Maharashtra was conquered by the Vakatakas (250 AD-525 AD), who were the rulers of the state. Later, in 753, Rashtrakutas ruled the region. Rashtrakutas were then defeated in 973 by the Chalukayas, who ruled parts of Maharashtra until 1189, when they lost to Yadavas of Deogiri.Thus Maharashtra was under continuous wars and conquests of various dynasties. The first Muslim emperors who invaded Maharashtra in the 13th century were Ala-ud-din Khalji and by Muhammad bin Tughluq. When the Tughlaq dynasty fell in 1347, the Bahamani Sultanate overpowered the region. They ruled it for the next 150 years. After the Break up of Bahamani Sultans In the sixteenth century, regional Muslim powers like Nizamshahi, Adilshahi, and Qutubshahi established their rule in the Deccan region. They basically served the Mughal Empire. During the 17th century there was a sudden rise in power of the Maraths who were the Marathi speaking Hindu warriors of the region. The Marathas emerged as a strong power under Shivaji who ruled from 1646 to 1680. Shivaji constantly battled with the Mughal emperor Aurangzeb and Adil Shah of Bijapur. 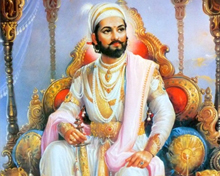 In 1680 Shivaji's son Sambhaji Bhosale became the ruler of the Maratha kingdom. He was captured, tortured and brutally put to death by Aurangzeb. Then Sambhaji's son, Shahu Bhosale declared himself to be the legitimate heir to the Bhosale throne. In 1714, Shahu's chief minister (Peshwa) Balaji Vishwanath came to power. Thus Maratha Empire came to an end. After the fall of Maratha Empire the Peshawas came to throne and ruled during the period 1712 to 1818. Balaji Vishwanath (1712-1721), Bajirao Peshwa (1721-1740), Nanasaheb Peshwa (1740-1761), 'Thorale' Madhaorao Peshwa (1761-1772), Narayanrao Peshwa (1772-1773), 'Sawai' Madhaorao Peshwa (1774-1795) and 'Second' Bajirao Peshwa - 1795 to 1802 were the other important peshawa rulers of Maharashtra. The fall of Ahmednagar fort in 1803 marked the end of Indian rule in Deccan Region. In 1804, General Wellesly proclaimed the Deccan in a state of chaos, established military rule. The Peshwas remained as puppet rulers. At the beginning of the 20th century, the struggle for independence took shape led by Bal Gangadhar Tilak and the moderates like Justice Mahadev Govind Ranade, Gopal Krishna Gokhale, Vinayak Damodar Savarkar, Pherozeshah Mehta and Dadabhai Naoroji. In 1942, the Quit India Movement was called by Mahatma Gandhi which was marked by a non-violent civil disobedience movement and strikes. The present state was formed in 1960 with Bombay as the capital, when the Marathi and Gujarati linguistic areas of former Bombay state were separated under the Bombay reorganization Act. Yashwantrao Chavan became the first Chief Minister of Maharashtra.Maharashtra became the main channel of cultural exchange between southern to northern India.